Fried Chicken. Champagne. Classic Rock. Here. Ah, the thrill of a good dive bar. The cheap beer. The fried chicken. The champagne. The foie gras. Remember: we said good dive bar. 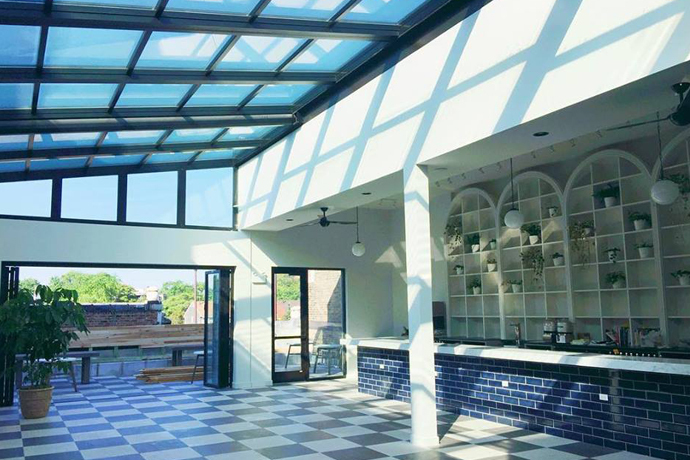 Exhibit A: Max’s Wine Dive, where comfort food and wine and you get together to do great things, opening Tuesday in Wicker Park. It’s basically just a relaxed, no-attitude wine bar. The floor is concrete. The brick walls are adorned with surrealist paintings. The jukebox has more classic rock than the Loop’s drive-time playlist. Apparently albariño demands less talk and more rock. You’ll come here with a date on occasion, sure. But more likely you’ll treat it as a rock-solid happy hour destination for champagne and bison sliders. We hear you’ve been searching for a place like that. So take your time. Don’t rush this thing. You’ve got over 100 wines on your hands. Eight of which are on tap, all of which make damn good sense next to shrimp and grits, fried chicken and a seasonal menu offering foie gras, that familiar dive bar staple. And thankfully, your server is trained in the mystical art of pairing mac and cheese with the appropriate... well, whatever wine you want. They’ll let you taste anything before you order, of course. Now’s the time for indecision.